Last weekend I finally bought the ottoman/coffee table I had been eying since my friend Brooke bought it for her apartment over a year ago! It went on sale after Christmas so I took that as a sign. It is from Urban Home (teal coffee table) which is a chain in California only (I think). It opens so you can store things inside AND it has a removable tray. I have had the same ottoman since I moved into my first LA apartment back in July 2010. I found it at a garage sale and it was exactly what I was looking for. I like to be able to put my feet up when I watch TV so I prefer something soft and not an actual coffee table. But for parties it is helpful to have a place for people to put their drinks and food (couldn't put any cups on my old ottoman). With the removable tray I can now have a place for cups and plates! I thought I had a better photo of my old ottoman but this is all I can find (from my apartment tour: living room post). I have always thought it is best to splurge AND save when it comes to furnishing and decorating an apartment. In my first LA apartment, which I moved in to summer 2010, I splurged on a new couch and bed from Macy's. Everything else (tv stand, bar stools, ottoman, etc) was from garage sales, Craigslist, ikea, etc. It was important for me to stick to a budget and save money where I could. I decided not to splurge on a table for awhile. Mostly because I was happy to eat at my bar or on the couch. 6 months later I found a floor sample on clearance at Crate & Barrel (see post here). I had been at my job for almost a year so I felt comfortable "investing" in a nicer table. Only one blue chair was on sale so I got three white chairs and one blue. For me it was worth it to save and not have four of the same. In January 2012, almost 18 months after I moved in to my first LA apartment, I finally splurged on a media stand from Crate & Barrel. Previously I had used a rolling media stand (cart?) from Ikea that I found on craigslist. I knew I eventually wanted something really nice that I could use for years but a new bed and couch were higher on my list when I first moved. I saved up over the 18 months and used some of my Christmas bonus to buy the media stand. Of course not even a month later I had to move unexpectedly but luckily it wasn't too tough for the movers to move the media stand. While it definitely would be nice to magically have everything on my apartment wishlist right away that just isn't possible. Each time I make a "home investment" I smile because it's always worth the wait! I am thinking I will finally get a headboard for my bed in the second half of 2014 (yep, I still don't have one!). What are you splurging on this year? I totally understand that. I left almost everything behind when I left DC. Starting fresh is so nice! Love the ottoman and media stand!!! Teal is always a great pop of color but so soothing in a home! The ottoman looks nice in your place, Kate! We used our store credit from returning several wedding gifts that wouldn't fit in our kitchen, along with some extra commission $ to buy this trunk (and matching side table) from Crate and Barrel late last year: http://www.crateandbarrel.com/hunter-ii-trunk/s595490. I love pieces that you can store stuff inside! What a smart idea! I love that you can even store wine bottles in there!! 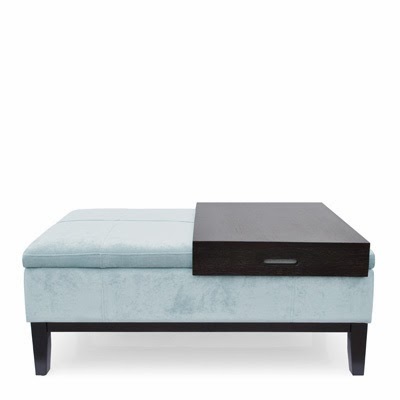 The ottoman is so neat with the sliding tray! Looks great! I love the media shelves from Crate & Barrel. A few of my friends have that in their apartments and it is such a space saver and very nice looking!